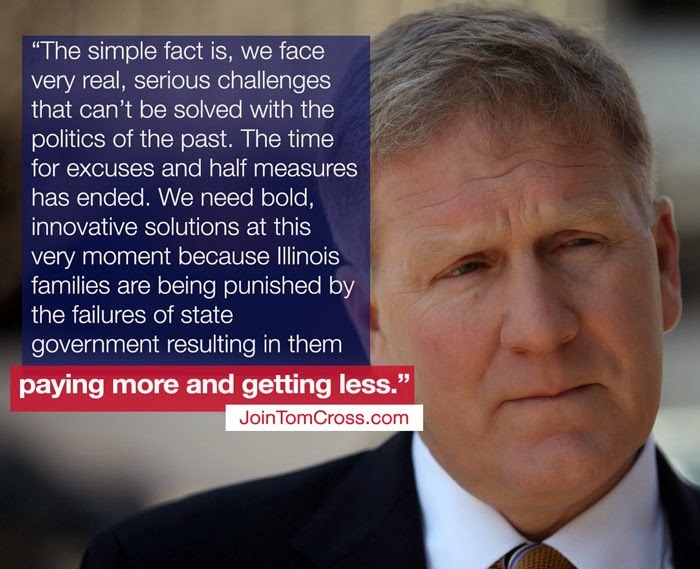 In a piece titled "One Bold Solution", Illinois Candidate for State Treasurer Tom Cross has called on Governor Pat Quinn to deliver during his budget address today. Tom Cross has been vocal in calling for what he calls an "honest balanced budget". He has a letter up asking for citizens to join his campaign to demand the Governor and Legislature deliver a balanced budget. You can go sign the letter at honestbalancedbudget.com. Three years ago, Democrats – namely Governor Pat Quinn– promised us that when they raised our taxes they would use that money to pay our backlog of bills. Three years later, the 67 percent tax increase has chased thousands of jobs out of Illinois, but our unpaid bills still remain at over $7 billion. What’s the real impact of a billion dollar deficit and the unpaid bills? Social service agencies don’t receive funding and they reduce their workload, jobs are lost, and taxpayers pay late payments which totaled $318 million last year alone. The impact of this mismanagement isn’t just about numbers, it’s affecting people and Illinois’ future. We were told that the tax increase would allow for greater investments in education and safety net programs for those who most need our help. Yet now we face a budget that seeks deep cuts to those very same programs. ...We must put a stop this cycle of weak leadership and poor decisions that penalize citizens. As Governor Quinn unveils his budget address, it is my sincere hope that the numbers are real, the budget assumptions are sound and spending decisions are responsible and reflect the priorities of taxpayers. And most importantly, that he proposes a balanced budget. But if this budget is built on gimmicks, false assumptions and bad math, then it should be immediately rejected. We simply cannot afford any more bad decisions. Illinois is craving results that positively and meaningfully impact people’s lives. That begins right now with having an honestly balanced budget.